1800 Sq. feet, 3 bedroom, 2/12 bath, great city location! (Note: The Minimum Stay is 2 nights, not (“2-14 nights.”)) Our home offers the best in city living! It is just minutes away from I-80, Rancho San Rafael Park, downtown Reno, the University, Reno-Tahoe airport, and McCarran Blvd. The deck is perfect for viewing the Reno Balloon Races--they usually float directly over the house. Built into a slope on a beautifully landscaped corner lot, our 1994, 1800 sq.-foot, split-level home was recently renovated. The main level features beautiful Brazilian Cherry floors throughout, while the front entry and upstairs bathrooms have porcelain tile floors. The living room area is defined by an oriental rug, upholstered swivel rocker, reclining leather chair, and sofa, all facing a small gas fireplace. A portable TV stand, which stands in the corner of the master bedroom, can easily be rolled into the living area for viewing. The picture window looks out onto mature landscaping with many trees and shrubs that house local birds. Visitors are welcome to fill the feeders, where we attract hummingbirds, quail, finches, jays, and occasional cedar waxwings. The formal dining room leads onto an upper level deck, complete with a gas grill and seating area for outdoor summer dining (and great views of the Reno Balloon Festival!). There is an excellent, well-maintained Kawai upright piano at the end of the dining room, which our guests are welcome to play. The kitchen has gorgeous Rainforest marble countertops, a composite granite sink, Jenn-Air gas stove with convection oven, new Bosch dishwasher, large-capacity Samsung refrigerator, a Cuisinart toaster oven and blender, and Kitchen-Aid mixer. It is a kitchen organized and used by cooks. The upper level master bedroom has a high king bed, inset dressers, light-blocking blinds, and walk-in closets. It is adjacent to a new, luxury bath with a large walk-in, double-headed shower and generous teak bench for drying off. The vanity is composite stone with travertine vessel basins and porcelain tile floor. Heading down the staircase, one enters a small living area with a couch, desk, and table. The laundry area is nearby, behind louvered doors. Outside the sliding glass doors, a shaded patio awaits, with additional tables and seating areas, as well as a fire pit with string lighting and optional vertical awning. On either side of the den are two small bedrooms, the Jungle Room, featuring a hand-painted jungle mural by a local artist, and the Periwinkle Room. The downstairs bathroom has both a tub and shower. All of the downstairs is carpeted. The outside property features mature landscaping and a drip-irrigation system, installed over a period of twenty-five years by the owners. There are two maple trees, a Japanese plum, a dogwood, an apple, an ash, and a pin oak surrounding the property, as well as numerous, varied shrubs and bushes. A large fountain, which the birds love to visit, sets off a sloping garden near the house entrance. Three separate sidewalks, two from below, and one directly in front, all lead to the front door. The middle one takes you under an arbor; the lower one, near the back gate, features a bench and additional small gardens to view from the bottom, looking up the slope. The main sidewalk entrance features potted flowers on the left and a garden of vinca as well as a shaded, western wagon wheel bench on the right. Our garage is unavailable, and a Jeep will be sitting on one side of the driveway, so one driveway space is available for renters, as well as plenty of additional street parking in front of the house. Wi-Fi and central air conditioning are included. Only basic cable is available. A gardener and housekeeper will maintain the property. Maintaining a clean, spotless home is a priority for us and for our guests. The price and two day minimum stay as listed on VRBO are firm. There is a refundable $350 deposit which will be returned 7 days after your visit ends, unless there are additional charges for cleaning, damage or fees imposed by VRBO for processing. Note: due to heavy alkali dust generated at Burning Man, we will not accept reservations from attendees. Violations will result in non-return of the deposit. We have lived in this house since 1994, having moved to Reno from upstate New York. We did all the landscaping and most of the remodeling and design ourselves while juggling careers in music and law, and raising our now-adult sons. Since they both live in New York and we are now retired, we divide our time between Reno and the East. We have always loved to entertain and often host overnight guests. Mark loves to cook for them, especially breakfast delights, including his specialty, crepe-like pancakes, as well as German pancakes, scones, and muffins. We have been married forty years, having met as new members of the Rochester (NY) Philharmonic, fresh out of graduate school. Mark grew up in Reno and missed it, so it was inevitable that we would move back here some day. He picked up a law degree before we moved, and practiced civil law while Ginny wended her way quite often to play as a substitute violist with the San Francisco Symphony. Over the years, she went on many tours with them, Mark accompanying her when he could. Mark is a gifted craftsman and handyman; we are proud of our home and work hard to maintain it. We hope you enjoy it as much as we do. Now that you know a little about us, we'd be grateful if you tell us a little about you! We chose our residence because of its excellent location, being conveniently located near virtually every attraction in Reno and the surrounding area. We love our walks and hikes in nearby Rancho San Rafael, which includes a world-class arboretum, a rare collections of outstanding trees in Nevada.We can see the Balloon Races in September without ever leaving our deck. We can hop onto the freeway or over to University of Nevada events in five minutes. Truckee, the Graeagle, CA area, and Tahoe getaways are all within an hour or so. We are within minutes of the revived Mid-town area, the Riverside arts theater, the Nevada Museum of Art, and best of all, Artown, a downtown arts festival all of July! It was newly built and had no previous owners. We were able to landscape it and design the interior as we desired. We enjoyed our stay here, a nice and relaxing property. We were in town for our daughter’s wedding and the place was perfect for us. Location good for us, close (driving) to airport, downtown etc. thank you! Our family just loved our stay in this beautiful home! It has every amenity you could ever want and our large family was so comfortable. 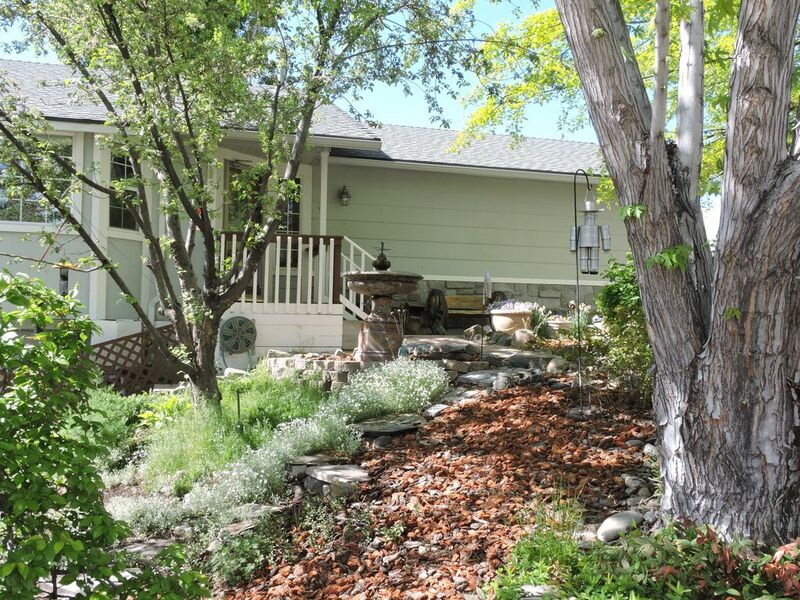 The outside is just as lovely as the inside and the entire property is sparkling and meticulously maintained. The owners were incredibly helpful, attentive and gracious. Thank you!